Environment and sustainable development challenges are a matter of global concern. Trillions of dollars of mostly public money are invested every year in domestic and international policies and programs to address these　challenges. The effectiveness of these policies and programs is critical to environmental sustainability. Performance audits that examine the effectiveness of governmental policies and programs heavily influence their implementation. Despite this, performance auditing in the environment field　has received very little academic attention. 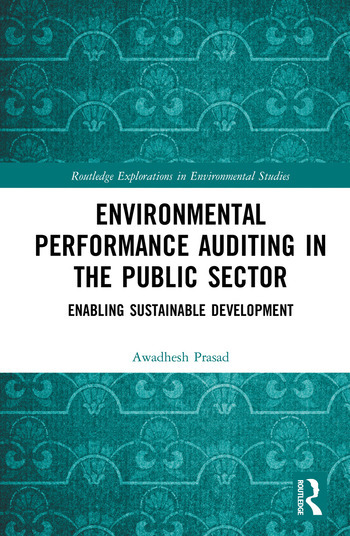 This book takes a closer look at performance auditing of public sector environmental policies and programs. It examines trends in global environmental performance auditing; and how it is currently practiced drawing on a global survey and case studies from Canada, India and Australia. In doing so, it identifies issues and challenges faced by Supreme Audit Institutions in undertaking these performance audits. This book will be of interest to students, scholars and practitioners of sustainable development, environmental auditing and public sector auditing as well as to donor organisations engaged in these areas. Awadhesh Prasad is a visiting fellow at the Australian National University’s Fenner School of Environment and Society, and works at the Murray-Darling Basin Authority, Australia, where he has been involved in monitoring, and auditing of environmental policies and programs for over 15 years.